Chewy, spicy, cinnamon gummy candy is the perfect Valentine’s Day treat for the cinnamon lover in your life. I have a confession, I am obsessed with cinnamon bears! I absolutely love them, but unfortunately they are pretty hard to find out here in Florida. I tried the ones they sell at Target, the first few bags were pretty good, but then I bought another bag a month or so after the first couple and the taste and texture were different = more waxy and firm less cinnamony-goodness. Needless to say I haven’t bought them from there since. I have been wanting to try my hand at making gummy candy for a while now and yesterday I finally decided to take action! I’m going to be honest, I was intimidated to make these, there are tons of recipes online for gummies using a gelatin and jello mixture, but since I wanted mine to be cinnamon, I didn’t think using a cherry base was the best option. So after scouring the internet for a while I finally decided to use this recipe as my starting point. I wasn’t quite sure how it was going to turn out using juice, but the strong cinnamon flavor of my LorAnn Cinnamon Oil prevailed. I am definitely going to be trying these again soon, tweaking the recipe here and there. I’ll definitely update you all when I get them to an exact science. I hope you’ll give these a try – Valentine’s Day is just around the corner you know; chewy, spicy cinnamon gummy candy for the cinnamon lover in your life, enjoy! Prepare four 12 filling candy molds with cooking spray, set aside. In a medium saucepan add the juice and sprinkle the gelatin over, let sit 5-10 minutes until the liquid is absorbed. Over medium heat melt the gelatin mixture until smooth, remove from heat and add the honey and cinnamon oil and stir until smooth. Using a measuring spoon or spouted measuring cup pour the mixture into the molds and let sit 5 minutes. Transfer the molds to the freezer for an additional 5-10 minutes for firming. Pop out the gummies and enjoy. These look so cute! Perfect for Valentine’s Day! Great post! I’m your newest follower! hi Emily! just recently found your blog-your recipes make me happy so i nominated you for the Leibster Award! HOORAY! I love cinnamon, and these are so festive! My kids love gummies, but I don’t know if they’d go for cinnamon – think I could substitute strawberry or something like that instead? I love love love cinnamon flavored things so I’m sure these would be absolutely delicous! Pinning for future reference. I’d be tickled if you’d link up at this week’s Off the Hook! What a healthy and gorgeous treat! Delicious indeed!!! And adorable too!!!! Mmm these sound yummy. 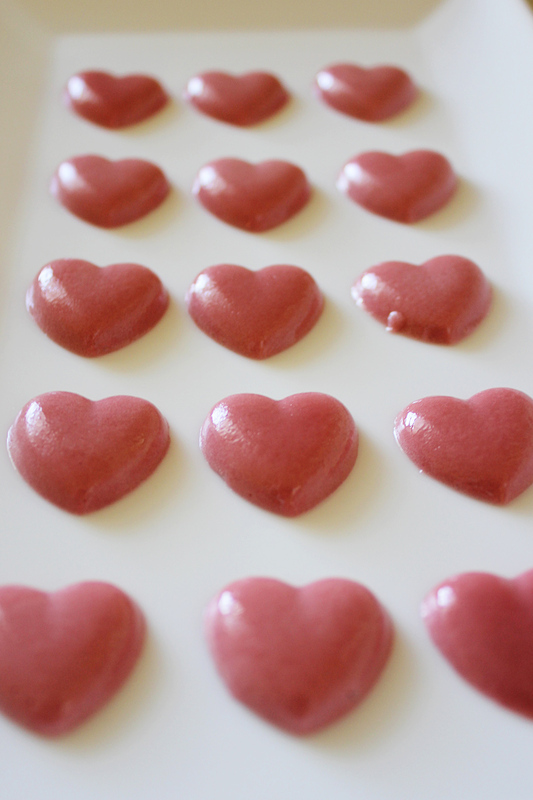 And now I have a craving for cinnamon gummy hearts. I love those cinnamon bears too, but I haven’t had them in a while. These sound great and I love the cute heart shape!!! This is a very easy simple recipe thank you! However, if you are like me and without candy molds at the moment, do not try to make these with the old Powder Sugar mold trick. They do not set up well in that and become gooey and wet where it sits on the powdered sugar mold. Invest in silicon molds! Excellent recipe though thank you! I was wondering if you can use plastic molds or does it have to be silicone for gummies? The ones I used were plastic I think either would be just fine. Can’t wait to try! Can I use cinnamon extract instead of oil? Would I use the same amount?